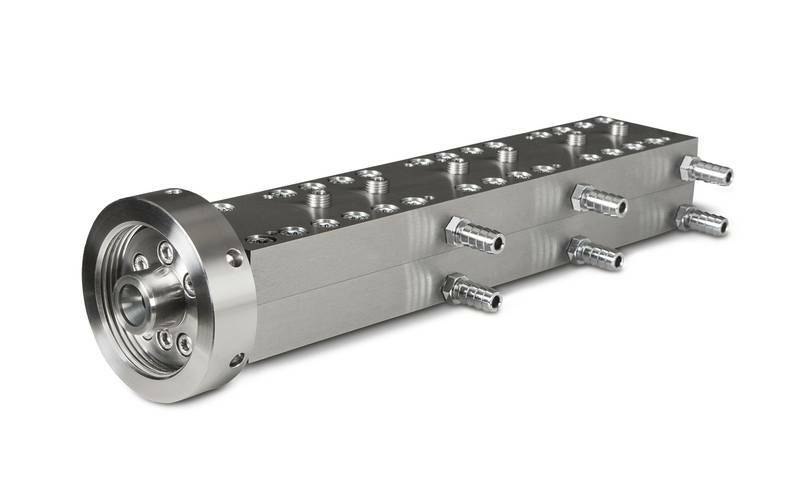 The Modular Cooling Die in combination with an R&D extruder is an ideal tool for the production of texturised plant proteins on a laboratory scale. The modular concept allows the extrusion of different product dimensions as well as different raw materials (e.g. wheat gluten or soybeans). A profound product development in the laboratory and pilot plants offer time savings and a higher flexibility compared to large production plants. During the ongoing measurement you keep the full control over the entire process. Six openings along the nozzle allow for example pressure or temperature measurement of the processed material. Structural changes can thus be recorded in real time and correlated with the resulting product properties. The modular die construction consisting of a bottom and a top half ensures that different product sizes can be extruded. We are happy to adapt the die to your requirements! Be a step ahead of the competition with the Modular Cooling Die in combination with a Brabender laboratory extruder in the product development of your meat-like plant proteins. In which institutions / industries can the solution be employed? For which application areas the solution is suitable? The Modular Cooling Die can be used in conjunction with a Brabender or comparable lab extruder. Which materials can be tested with the Modular Cooling Die? Which analyses can be conducted with this solution? The design concept of the Modular Cooling Die allows the production of extrudates with different product sizes. By replacing the lower nozzle halves, the extrudate's height and width can be varied flexibly. The bottom halves can be customized at any time. Tailor made: Do you need a special process length? If you have specific requirements not only in the extrudate's height and width, but also in the entire nozzle length, we are happy to develop a customized solution. In conjunction with the Modular Cooling Die you comfortably texturise vegetable proteins with the high-performance stand-alone solution Lab-Compounder KETSE 20/40. Addtionally you benefit from the space-saving dimensions of this extruder.